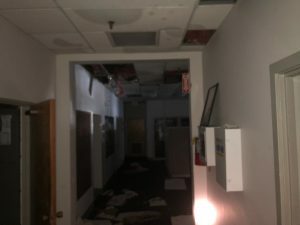 As Hurricane Michael approached Nexstar Media’s WMBB in the Florida panhandle town of Panama City (DMA 150) on Oct. 10, station management was feeling fairly confident. But Mother Nature has a way of making hash of any plan. 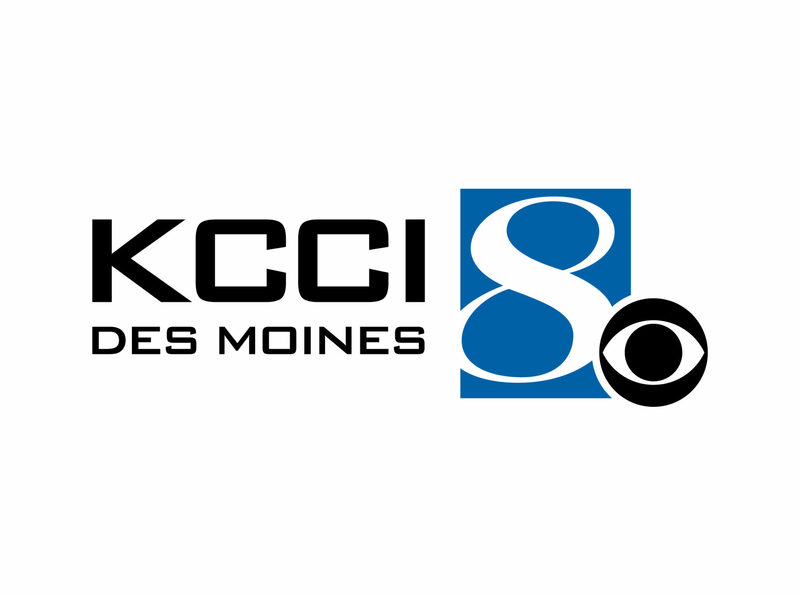 It would be 10 long days before the ABC affiliate could restore full local service, and operations are still far from normal. The plan called for bringing all reporters into the building by a specific time so no one was stranded and endangered in what became a Category 4 storm. The station had a generator and an underground gas line to fuel it. The sales department would provide food. Cots were stationed in offices so staff could sleep in shifts. The engineering department made sure the station had necessary equipment. The marketing department folded into the news department to help provide content. Staff were to travel in pairs. Sister stations in the Nexstar family were queued up to pitch in. External security cameras could show the conditions outside. If the station had to evacuate, employees could go next door to the two-story First Baptist Church building. The station was self-reliant. It had a generator fed by underground natural gas, on-site master control and didn’t hub any other functions. 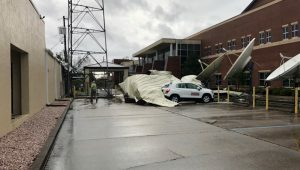 With the leading edge of Michael packing winds of more than 130 mph, the National Weather Service in Tallahassee issued its first extreme wind warning at 9:19 a.m. “Storm surge is one thing, but wind is a whole different story,” Golden says. The WMBB team hunkered down at the station, with some shooting video through the windows and garage. But the high winds on the leading edge of the storm proved too much for the station. Parts of four different roofs hit the WMBB building. “It was terrifying,” Golden says. The fourth roof — from the church next door — nicked the natural gas line at 12:40, shutting down the generator and knocking the station off the air. The RF chain was also later broken by damage to the STL and to the transmitter. “We probably would have been OK if that roof hadn’t fallen on us, but once it did, it punched holes in our roof, and it was game over,” Golden says. Although wireless service was spotty by the time the generator went dark, T-Mobile service was still good enough that the station was able to continue “broadcasting” via Facebook Live. A reporter in adjacent Walton County was able to also contribute some reporting. Because of the roof and the presence of natural gas in the air, employees evacuated to the church next door at 3-3:30 p.m., by which time the wind speed had fallen to around 50 mph. Staffers had to pound on the church door with a crowbar to get in. Although the church had lost its roof, the first floor of the two-story building was intact and was able to provide sanctuary. 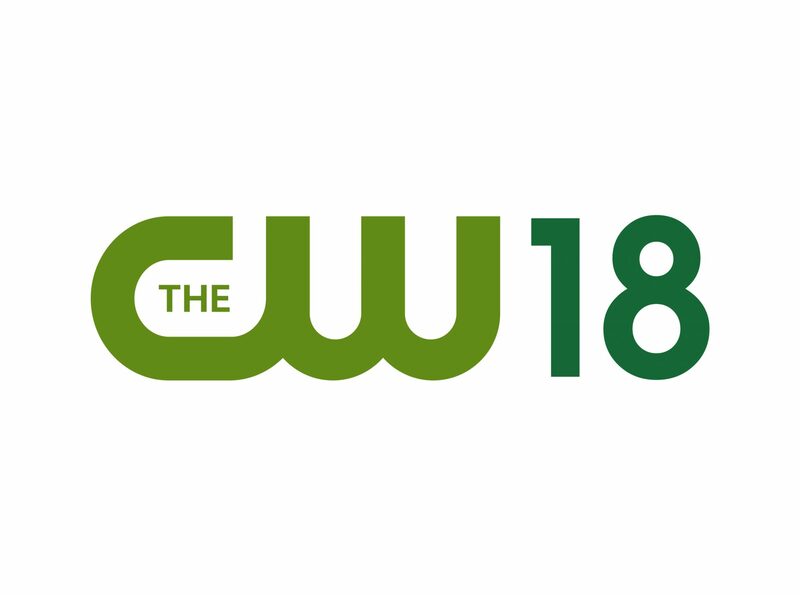 With the station silenced, Nexstar’s WFLA Tampa, Fla., soon began producing newscasts for the market and would continue doing so for the next 10 days. A satellite truck was used to send video back and forth between Tampa and Panama City. But the Panama City crew wasn’t done. 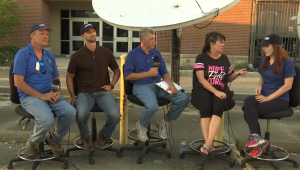 They set up a makeshift outdoor studio in the station parking lot and as repairs were being made to the station and to the RF facilities, they produced local news segments, eventually as much as six hours a day. The outdoor set-up used “remnants of the roof in the background as our set piece,” Cole says. On Oct. 20, WMBB was back on its feet, producing newscasts from inside the station and broadcasting over the restored STL and transmitter. 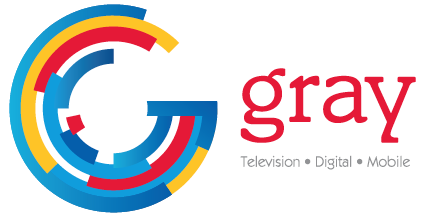 Crucial to restoring service was help was help from other Nexstar stations. Within 24 hours of the hurricane, the “Nexstar Nation” in the persons of news directors, anchors and other roles began arriving in Panama City to help. “They said: ‘Your lives just got destroyed and you’re serving your community. Let us do that so you can take care of yourself,’ ” Cole says. The roof is partially gone and 70% of the building can’t be inhabited. Key equipment outside is damaged and may take months to repair. On the upside, master control and the studio are largely intact. “We got lucky there,” Cole says. While there was water damage, most of the equipment racks also escaped damage, he says. An updated version of the emergency plan will address lessons learned from Michael. In addition, Cole says, having mobile hotspots and service from different providers makes a lot of sense. 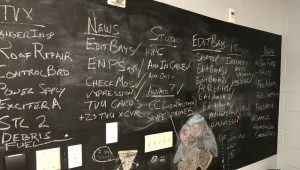 Additional battery sources, ways to recharge the camera batteries, extra small gas generators and laptop editors are all items Golden wants to include in the updated plan. So many trees clogged the streets that WMBB had to find a crew to plow a path down the road in front of the station building. The station needed more fuel brought in for news crews and generators. “Fuel becomes a very important thing,” Golden says. Visiting Nexstar employees staying in hotel rooms in neighboring counties were bringing full cans of fuel to help keep news crew vehicles moving. Despite plowing of roads, debris remained a major problem.